When Liston Sprauve, an emergency responder on St. John suffered a health crisis last week, repeated calls to the 911 center went unanswered and by the time help could be summoned, he had died. When Sprauve told a relative to call for help, no one picked up the phone at the 911 call center. Instead, that relative said, he got a recording informing him he dialed the wrong number. Family members said they made roughly nine calls to 911, on both a cell phone and a landline. But instead of reaching a dispatcher, family member Elroy Sprauve said they got a recorded “wrong number” message. The problem appears to lie with both cell phone service and landline service, V.I. Territorial Emergency Management Agency Director Mona Barnes told senators Thursday. 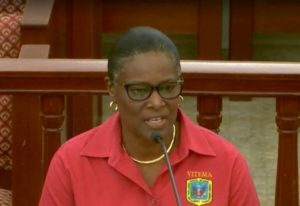 She again said VITEMA checked its 911 system and found it had no problems that day; an assertion she made earlier this week after reports of Sprauve’s fatal emergency hit the press. “My condolences go out to the Sprauve family,” Barnes said during Thursday’s oversight hearing of the Homeland Security, Justice and Public Safety Committee. She said she spoke to a family member directly on Wednesday. Sen. Novelle Francis (D-STX) asked how it happened. Barnes said the calls never got to them and pointed to the phone carriers. “None of the calls the Sprauve family made went to the 911 system,” Barnes said. The center was getting other 911 calls. “The majority of the calls were made by a cell phone, which speaks to the cell carrier,” she said. The family called from a landline too, so she called the territory’s landline company (Viya). “They too are making an investigation on that call to 911, where did it go,” she said. “The issue was not the 911 call center. It was the carrier” she reiterated. That the calls got a wrong number message “tells you right there that the call never made it to the 911 system,” Barnes said. That 2009 article cites VITEMA officials saying there is a lack of cell coverage, but since the V.I. Public Services Commission does not regulate cell carriers, it is up to those companies to decide whether and where to add towers. Sen. Positive Nelson asked if the recent problem was due to a lack of cell towers. “Yes it is,” Barnes said. No votes were taken at the oversight hearing. Present were: Nelson, Francis, Sens. Alicia “Chucky” Hansen (I-STX), Jean Forde (D-STT), Janelle Sarauw (I-STT), Dwayne DeGraff (I-STX) and Brian Smith (D-At Large) . I hope this family sues every agency involved – the government on up. I submit it’s VITEMAS responsibility to make sure EVERYONE has access to 911. Blaming Viya and ATT is easy. If this has been an issue since 2009 why have they not resolved it yet? That is an admission of guilt. Furthermore, how is it possible that two different providers on two different networks had a similar problem at the same time? Sounds like BS to me. The 911 upstream provider that VITEMA uses most likely had an issue. Which makes this VITEMAS problem. If you get a message on your mobile phone saying you called the wrong number – you are connected to a cell tower. This has nothing to do with cell towers. Also, the land line was giving them the same message. Don’t insult our intelligence. Telling us you tested the 911 system a week after the failure means nothing. Something was down, someone at VITEMA knows what happened. Time to come clean.